The law office of Northrop & Stradar, P.C. specializes in Business Law, Estate Planning, including Wills and Trusts, Probate, and Real Estate practice. Whether you require personal assistance with a will or business advice, our attorneys have extensive, broad-based experience in providing informed judgments and creative solutions. Since 1827, our firm has represented a multitude of clients – individuals and businesses. Along the way, as our clients’ business needs have become increasingly global, so has Northrop & Stradar, P.C., proudly representing start-ups and Fortune 500 international corporations. With our diverse expertise and knowledge, Northrop & Stradar, P.C. has the flexibility to provide general counsel to individuals and small companies, while also servicing large/international companies on complex, technical transactions. We invite you to browse our site for more information about our firm and how we can assist with your needs. You also can review details of our practice areas and law specialties. 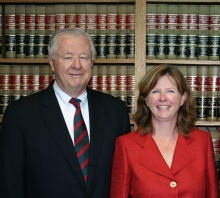 Or, visit the lawyer profile page for comprehensive biographies of our experienced, seasoned attorneys. If you have any questions, please call us at 845-561-8000. For general questions, you may also e-mail us at [email protected] or, if you prefer, please contact a specific attorney directly with your inquiry.